Twitter has announced a couple of additions to its image offerings today, including the ability to tag up to 10 people in a photo without using any precious characters up. 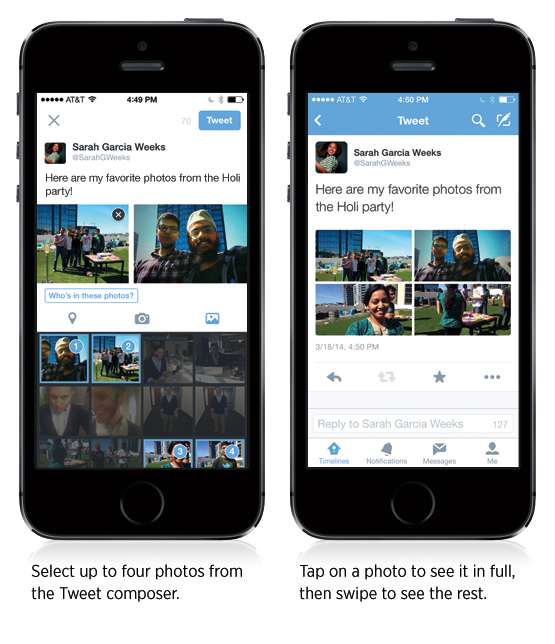 You’ll also now be able to attach up to four photos to a tweet, and Twitter will automatically craft a collage for you. 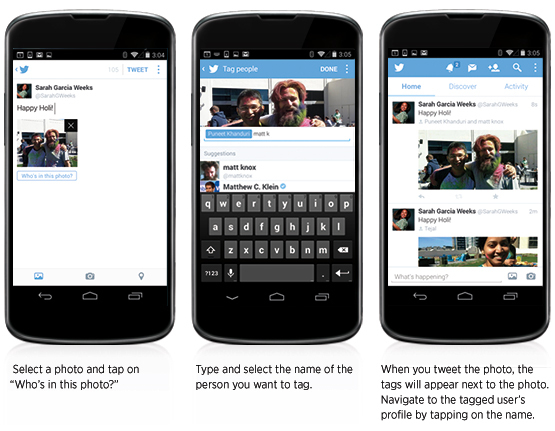 The people-tagging feature will undoubtedly offer Twitter a way to increase the density of its social graph. Adding the ability to link people to specific photos provides Twitter with information about the photo, but also additional relational links between individuals on the platform. Making the tags available without eating up character counts will doubtless encourage people to use the feature. This is an example of Twitter utilizing the “invisible” carriage of metadata contained in each tweet to truck along extra information. Longtime users of the service may remember that Twitter had plans to roll out a ‘notes’ field, which would have used this metadata, but canned it to build the Cards feature that is now at the core of its multimedia offerings, including photos. Note that you will get a notification each time you’re tagged, so there are new settings in the apps that allow you to toggle those off. My fervent desire is for someone at Twitter to realize that the metadata storage that sits alongside each tweet would be a great place to put usernames as well. There is no good reason for them to take up characters in a tweet. If this goes over well, maybe we’ll see that come to pass, as well. Notably, face tagging — or people tagging — is one of the core features of Instagram, a photo app purchased by Facebook because it was growing its photo store much faster than Facebook itself. Adding multiple photo support is cool, and it looks fairly nicely implemented. It will likely increase the number of photos shared on the service dramatically, and will assist those who use it in a news capacity. It never hurts Twitter to have more people sharing more photos. The tagging is likely the big update here, though, when it comes to helping Twitter retain users and encourage people to open and check the app regularly. If you’re being tagged, that’s one more “legitimate” reason for Twitter to tap you on the shoulder to tell you to look at Twitter. Other efforts in this space include notifications that tell you when people you follow are discussing a TV show or other event. Twitter has been experimenting with these features in its Android beta and apparently liked what it saw, as it’s now rolling out to all users. These new features will be available in the Android and iOS apps first. They’ll likely come to the web at some point, too. And, according to Twitter’s dev account, these features may actually be available for use by developers and users of third-party apps as well — something which has not happened a lot recently.